The New Mexico Tourism Department is grateful to industry partners who supported our historic 2019 budget increase. Thanks to your confidence and efforts, we received an additional $3.8 million in marketing and promotion dollars—the largest ever. The Tourism Department will utilize these funds to saturate current markets and increase visitation to our great state. Tourism is one of the largest employment and revenue sectors for the state – employing over 100,000 people, bringing in $6.6 billion in revenue and paying in $660 million in state and local taxes. Read full op-ed. Almost 2 million people have visited Meow Wolf since we opened in 2016, and more than one million have been tourists. Tourism has been essential for us and it makes an economic difference for every city, town and village in New Mexico. Read full op-ed. 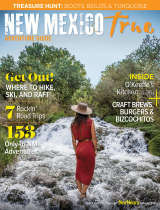 Tourism is the second largest employment sector and revenue generator in New Mexico. As we grow the economy – whether that is attracting businesses to move to the area or whether it is attracting retirees and businesses, it’s important to remember most people will first experience New Mexico as a visitor. Read full op-ed.